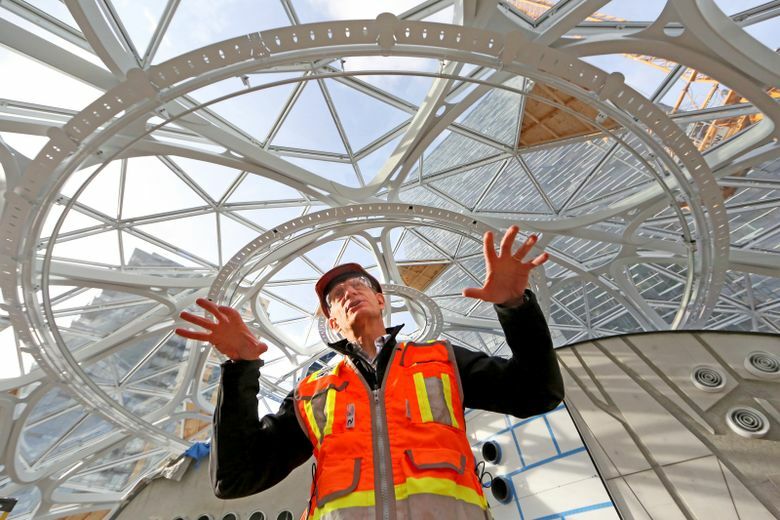 Long before they’re completed, Amazon’s eye-catching buildings draw a lot of curiosity. The glass domes are a central focus of the company’s effort to transform the city’s urban core. 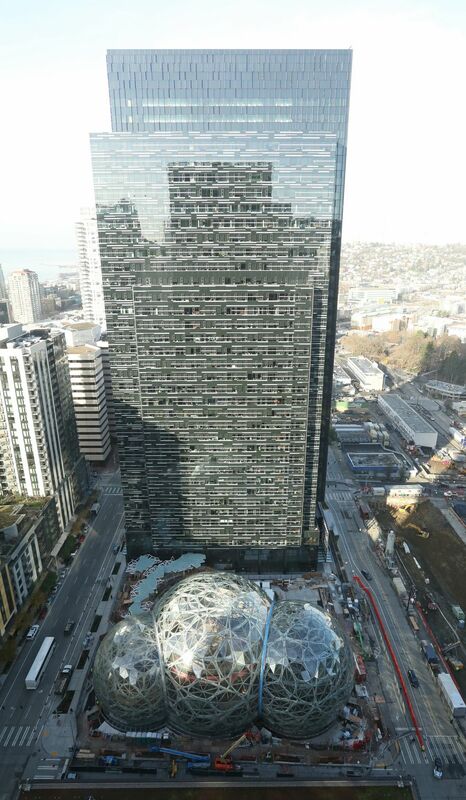 Of all of Amazon.com’s transformations of Seattle’s urban core, perhaps no single project has drawn as much curiosity as the glass domes slowly emerging at the corner of Lenora Street and Sixth Avenue. The fruit of a bold design, the so-called Spheres will serve as a haven of carefully tended nature geared to letting Amazonians break free from their cubicles and think disruptive thoughts. It’s an internet-era, Pacific Rim answer to the architecturally astounding gardens set up by European monarchs during the Enlightenment era. 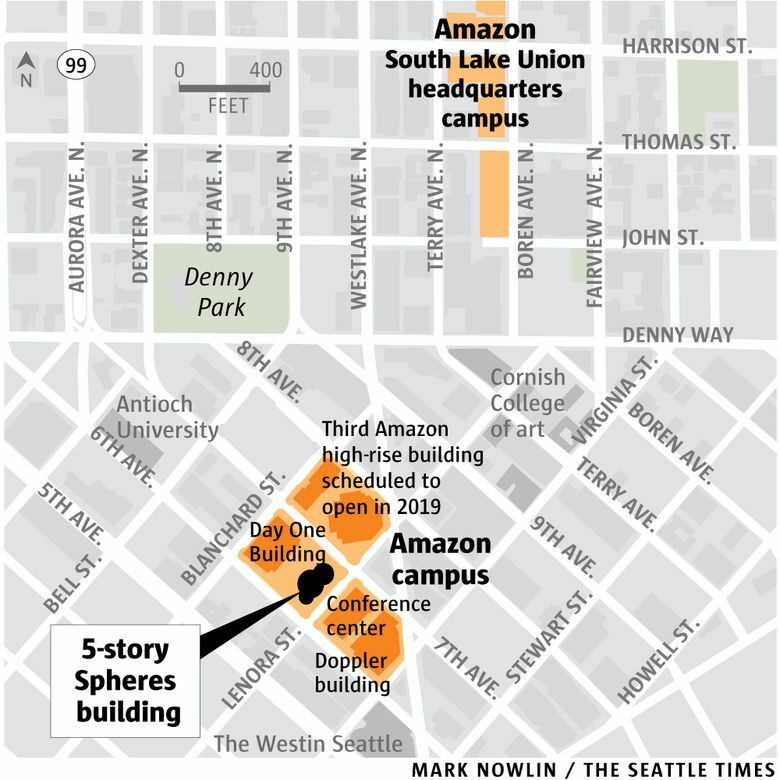 The structures are also the architectural crown jewel of Amazon’s $4 billion investment in building an urban campus, an eye-catching landmark that symbolizes the rise of what 20 years ago was a fledging online bookstore into a global e-commerce and cloud-computing leviathan. “We wanted to do something that was not only great for employees, but for the city as a whole,” John Schoettler, Amazon’s real-estate director, said in an interview. In Schoettler’s view, the Spheres also reflect his company’s character. “It’s all about our pioneering spirit, our being inventors,” he said. The erection of the Spheres comes at a time when several dominant tech companies, flush with cash, are making their physical marks upon the world in the form of innovative office space. Apple is building a futuristic, circle-shaped campus in Silicon Valley scheduled to open next year; Google is also planning a shiny new mothership. “The tech industry is trying now to express itself through buildings,” said Gundula Proksch, a professor of architecture at the University of Washington. A recent walk through the Spheres showed construction is well along. A towering concrete wall is in place that next year will be a canvas to luxuriant vegetation. So are the five stories through which more than 800 Amazonians at a time will be able to roam. The tallest of the three interconnected spheres will be 90 feet high and 130 feet in diameter, and it’s where all the activity will happen. The two other spheres are there to harbor trees. There will be waterfalls, a river, even treehouselike spaces overlooking tropical gardens. During the day, the average temperature will be 72 degrees, with 60 percent humidity, a climate akin to Costa Rica’s paradisiacal Central Valley — good conditions for both plants and people. Schoettler says the Spheres are going to look “fairly complete” from the outside by spring. In the early summer a 45-foot-tall rusty leaf fig tree from California will be lowered into the building from the top by removing some of the pentagon-shaped panels that make up its shell. The structures won’t be in actual use until early 2018. 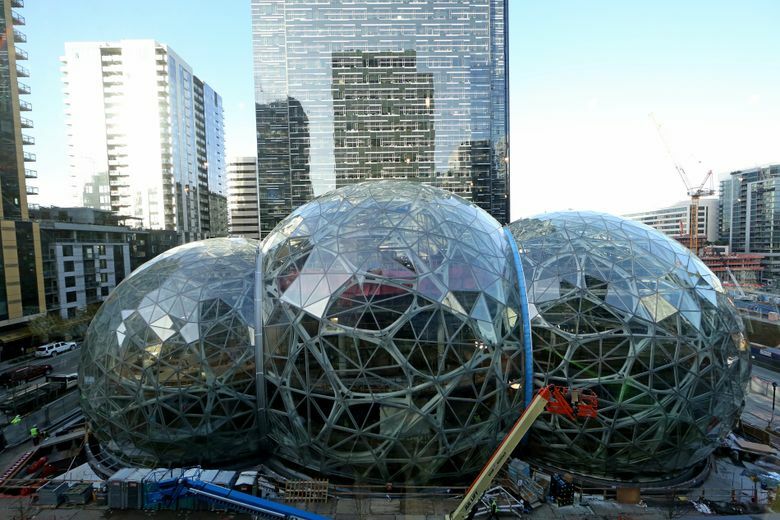 Amazon won’t say how much the Spheres, which occupy 70,000 square feet, cost. King County estimated the total value of improvements made on the block (including the adjacent high-rise) at $284 million. The lush concentration of plants the Spheres will host is no simple park. 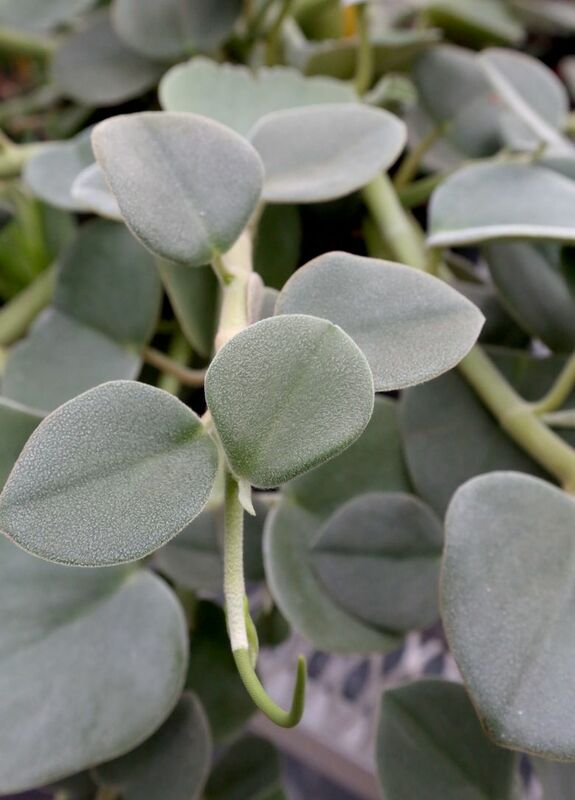 It was created with the ambition of a botanical garden, harboring exotic varieties and not just offering aesthetic pleasure, but imparting knowledge, too. The Spheres site originally was to hold a blocky, six-story building next to the 37-story “Day One” tower, which opened recently. The idea was to marry that to an environment where employees could work all year round. 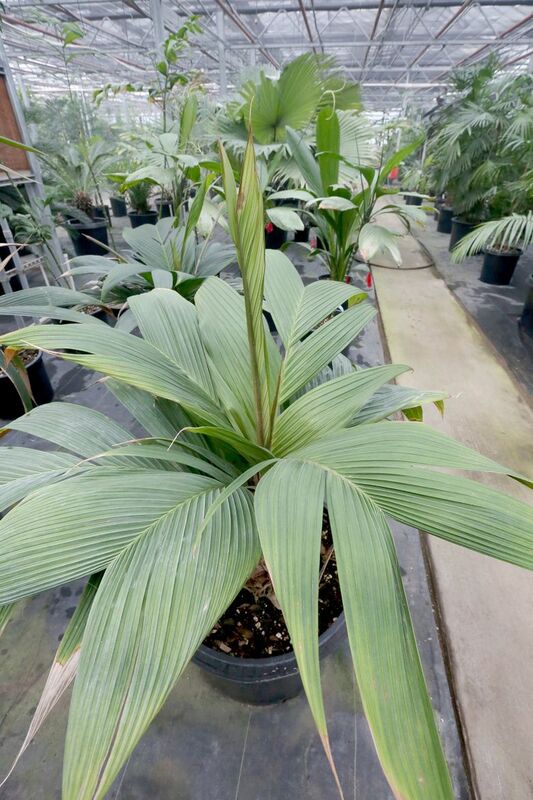 So Amazon hired a full-time horticulturist, Ron Gagliardo, a veteran of the Atlanta Botanical Garden. 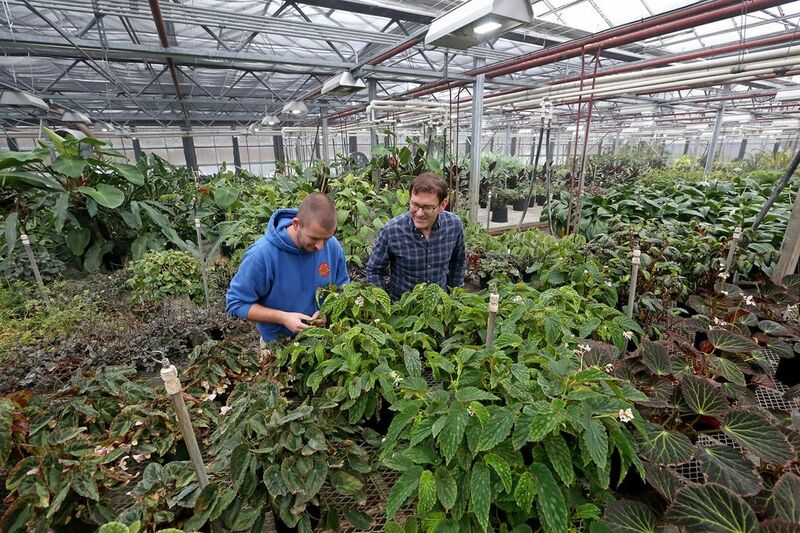 He and his team have populated 40,000 square feet of greenhouse space in Woodinville with plants shared by other botanical gardens or acquired through adventurous expeditions. This giant nursery also is serving as a temporary refuge to the University of Washington plant collection while the UW builds a new greenhouse. Thousands of plants, from coffee and cacao trees to foul-smelling corpse flowers, are arranged in rows. About 3,000 species from 30 countries are represented in the Woodinville nursery (the current plan calls for 450 species in the Spheres). 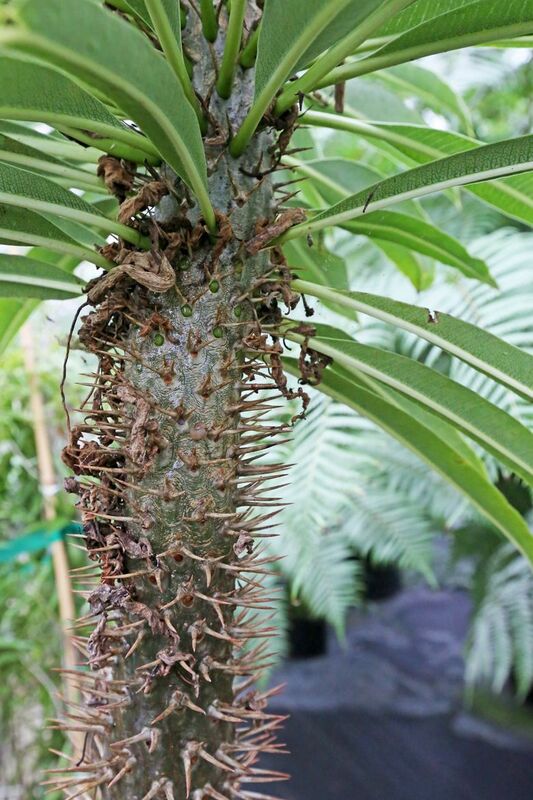 Some of Gagliardo’s favorites: Licuala mattanensis, also known as the paradise palm, and the carnivorous Nepenthes, or tropical pitcher plants. The nursery is also where the 60-foot living wall that will adorn the Spheres is being grown, piece by piece, in more than 500 panels that will be hung later on the five-story structure. Once in place, it will provide “an immersion, an instant connection to nature,” Gagliardo said. Dale Alberda, a principal at NBBJ, the architectural firm in charge of the project, said Amazon brought up the idea of a conservatory. So the architects came up with several ideas, many of them traditional. But the night before one of the presentations to Amazon, Alberda had an inspiration. It was a surprise to the city’s design review board, which previously dealt with a more square vision. From the point of view of the cityscape, the new design offered clear advantages: It was striking and interesting, much more so than many of the buildings going up around it. It’s a landmark “breaking the relentlessness of towers,” Proksch said. But the fact that it’s in essence a private enclosure for Amazon employees could limit its impact, Proksch said. 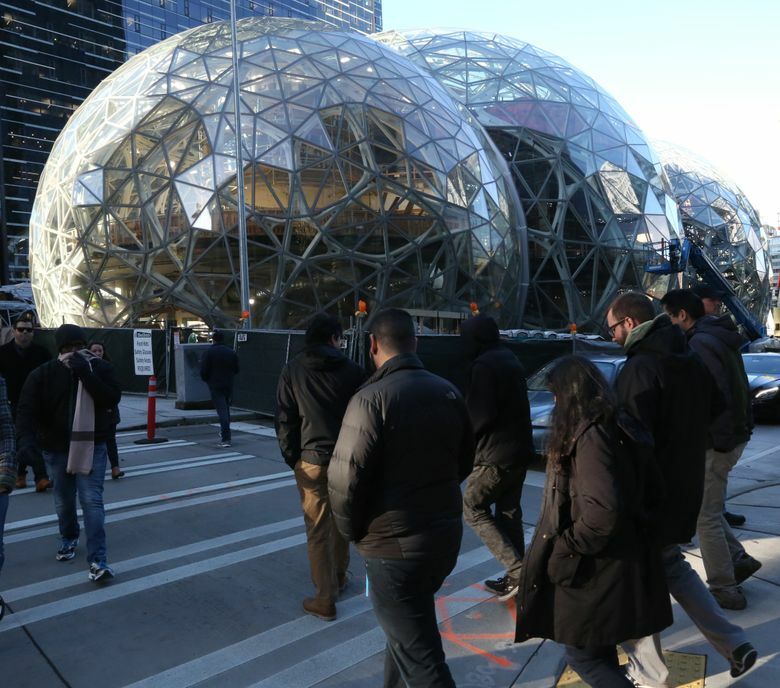 In any case, the Spheres’ impact pales in comparison with Amazon’s decision to set its campus downtown, which has produced a real transformation of the urban landscape. “Placing a headquarters in a major city — downtown — is again, on the larger spectrum, so much more important,” she said. 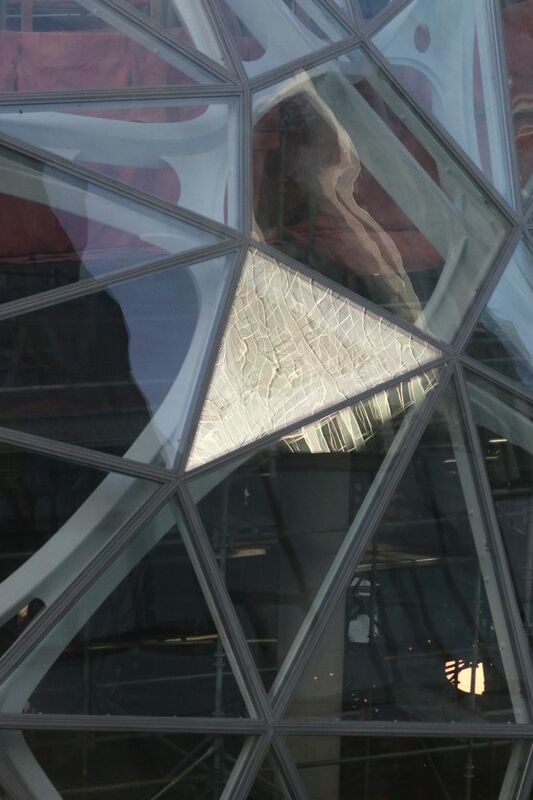 Amazon says that in addition to public areas surrounding the project, the Spheres will have retail space offering the public some level of interaction with the structure. (Amazon isn’t yet saying who the retailers will be.) It will be part of the campus tours Amazon started earlier this year. Amazon is also pondering other ways to bring visitors in, such as school field trips and partnerships with the UW. The building will also connect employees to something often missing from urban office spaces — nature. So Amazon will encourage staffers to bring lunch there, or buy it from the Sphere’s own cafeterias — or perhaps at Amazon Go, the cashier-less convenience store in the building next door. Staffers are also likely to have walking meetings and take in the view from birds-nest level above the tree canopy. “It’s a place where employees will be proud to bring their family,” Schoettler said.